The Player’s Companion for the Adventurer Conqueror King System is now available in PDF and as a hardcover + PDF bundle. If this is a thing you’ve been waiting for, go order it now. When you get back I want to talk about what it means for the current phase of the OSR. At Gen Con last year I gave a seminar on the Old-School Renaissance in which I said the OSR was dead. This wasn’t a point I expected to make, and it depends on the idea that the OSR is or was an entity like the Roman Empire, where being alive means it has borders that it defends against its enemies and can expel people from if they don’t meet the requirements for citizenship. By this analogy “the OSR is dead” looks a lot like “the OSR has won“. More people than ever use Roman numerals and live in representative democracies now that the emperor can’t send centurions to enforce the right way to do it. Likewise, it’s easier than ever to find a group of gamers who are eager to play in the old-school style now that it’s spread past the point where old-school cred is a requirement for entry. The level of philosophical analysis has decreased dramatically both on the blogs and message boards. If the job of the OSR was to analyze and rediscover the essentials of old-school play, I feel like this job has been done. (Playing at the World can fly the “mission accomplished” banner for the subset of historical analysis). The folks who started out pursuing these questions have, if not reached consensus, at least publicly worked out their own positions in enough detail that newcomers can dive as deep as they like to gain an understanding of OSR philosophy. If there are burning philosophical issues left that are specific to the OSR I can’t think of them, and I think it’s notable that our most consistently brilliant philosopher is now working on carrying his line of analysis outside our scene’s boundaries to games belonging to other movements and to the nature of roleplaying systems in general. The scene now focuses an enormous wave of practical application, including many more reviews of new products, analysis of older non-D&D games, and organization of face-to-face and virtual events. One of the reasons we started The Mule Abides was to share a perspective from New York Red Box’s regular engagement in TSR-era D&D, mixed with other old- and new-school games, that seemed unique. That’s no longer true. Old-school play is very popular and diverse at nerdNYC’s quarterly convention Recess, and I bet you’re seeing the same thing happening through hangouts if you’re on G+. Each time that someone starts a business in the OSR, they’re betting on its permanence and popularity. When I run along the Hudson after dark I often surprise rats on the pavement between the river and the park. It turns out that the speed at which they try to scamper away is close enough to my jogging pace that I can chase them for minutes at a time. I enjoy this activity quite a bit, and NYC being NYC no doubt I could find other weirdos who’d also find it fun. But before I launched a adventure tourism enterprise around river-rat chasing I’d have to be pretty sure that there was a regular enough supply of runners and rats to keep the business afloat. Commercialism fosters professionalism. As a blogger if I say “I’m going to write a multi-part series of posts about moving into the dungeon” but never do, I feel sort of bad but don’t lose any sleep over it. I only realize why this is an idiom when I’ve taken people’s money for a thing, there are delays in delivering it, and more nights than not I wake up frantic with dream-logic solutions, still carrying on imaginary conversations with upset backers, etc. I aspire to honor all my commitments but there’s no denying that the commercial ones carry more weight and are more likely to get done. Businesses seek to expand their markets. One of the first OSR controversies I was involved in was TARGA’s plan to create an outreach program for old-school play. It foundered over a number of things that seem outdated, including questions about whether it was even desirable to bring in outsiders. Now that it’s clear that outsiders are extremely interested in our thing and eager to spend their gaming dollars to find out about it, outreach stops being a community question like “what kind of missionary should we send to the South Seas” and becomes an individual one like “should I go pan for gold in California” – or, to carry on the OSR is dead analogy, “go loot the treasures left behind by the fall of the Roman Empire’s boundaries”. Even when I’m not trying to sell anything I think expansion is a good thing. I recognize the value of having the OSR’s borders hotly defended back when a core group needed to be undiluted long enough to define and tackle the key philosophical issues, but I really like how easy it is nowadays to to find common ground rather than fight turf wars. The remainder of Joe’s post talks about published material he sees as exemplifying a shift towards OSR phase II. He includes a number of games that I’ve talked about before as second-wave retroclones. This phrase balances looking backwards (the “retro” in retroclone) and forwards, with the presumption that there will be a progression of waves, each building on the last the way the second-wavers built on the original OSRIC, Basic Fantasy, Labyrinth Lord, and Swords & Wizardry. The Player’s Companion is the first supplement for ACKS, and it’s considerably more progressive and less retro. ACKS features several things that I think go beyond looking backwards and make genuine additions to the canon. Its economy was one I focused on in the post about building blocks of the next wave of retroclones. By this I mean not just the integrated structure that makes the price of swords line up with the wages of a swordsmith and the cost to field an army of swordsmen, a thing I admire but was never a problem for a GM as loosey-goosey as myself. The contribution from ACKS’ economy that I only vaguely realized had been lacking in my OD&D-based White Sandbox campaign was the way it contextualizes the heroes in the game world. Some vagueness about what’s beyond the dungeon was ideal at the start of a play-and-find-out campaign, but at the stage where they started looking to make a mark on the town and wilderness with their newfound riches and power, I found that I had no basis to adjucate key questions like “how far do we have to go to find someone who will buy a scroll much too potent for us” and “if the local ruler wants to challenge me to a duel, how tough is he?” For a sandbox game where you don’t have details all worked out for every society the PCs might visit, nothing beats ACKS’ brilliant insight that, if most XP come from bringing gold back to civilization, you can use the size of any given civilized area to determine on the fly how many heroes it has and how much of its resources they’re likely to control. These guys are my family’s second and third waves. Their parents are now old enough that any subsequent waves will have to actually be clones. So let’s imagine you’re looking to make your own perfect system for fantasy roleplaying, which is to say that you are a gamer. Even if you accept that ACKS’ work on economic and combat balance is an improvement you want to incorporate, you’ll want to leave lots of the other choices we made in ACKS on the scrap heap and come up with your own best solutions. Here’s where the Player’s Companion comes in. While writing ACKS, Alex Macris was also figuring out the design space for two key elements of the Moldvay miracle, character classes and spells, and this book is where he puts the guidelines in your hands. In my next post I’ll show how you to can use the Player’s Companion like a Rosetta stone to drive other kinds of classic gaming with the ACKS engine, or to pioneer an all-new approach in your own third wave retro-clone. However, I’ve already gone blah blah blah for a long time and the baby strapped to my body will soon wake up. 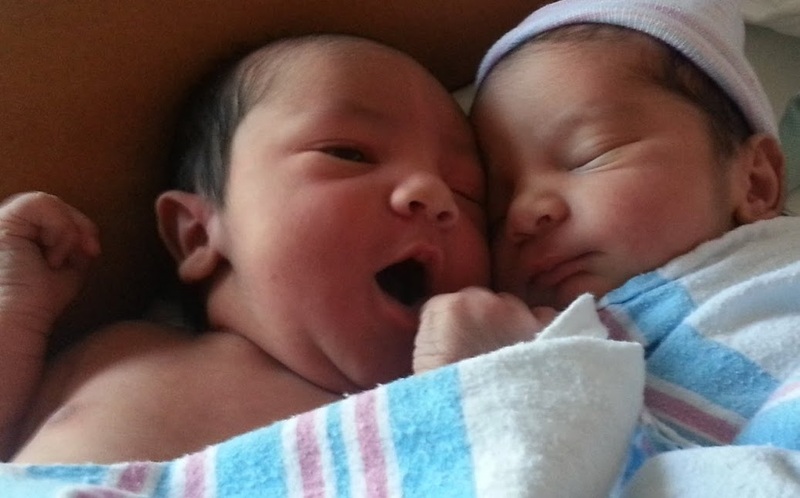 I hope you’ll accept that attaching these pictures of our newborn twins is a kind of negative-space Joesky tax, since otherwise I’d be tempted to put them in a post all their own which would have no gaming relevance at all.